I have friends that just can’t get that I actually find cooking a lot of fun. It’s creative, relaxing and extremely satisfying when you produce something that everyone loves. I recently spent a day with my 10-year-old niece Kelly cooking dinner for the family and will always remember her smiling face as we sat around the table eating. She was so happy that she had created this delicious food. Okay, entertaining can be stressful, so you need to plan carefully and make sure you are very organised. The dishes I most like serving are those that can be all prepared and in the oven before your guests arrive. So you can spend time talking to your friends rather than being confined to the kitchen the whole night. 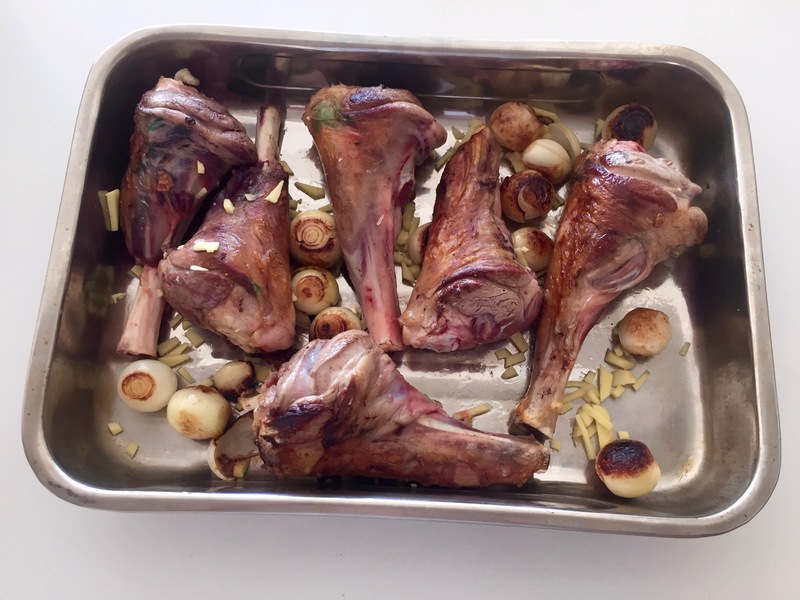 These slow-roasted lamb shanks are one of those.They do take a bit of preparation but you can do all that ahead – and clean everything up, too. And the dish is absolutely delicious and, I think, rather an indulgent treat. Working out quantities is also easy – one shank and two onions per person means simple serving – and no wastage either. Do you have a favourite dish you like to cook for guests? I’d love to hear about it. Turn the oven on to 130C. Fry the lamb shanks and shallots in the oil until they are browned. Transfer them to a large roasting dish. Sprinkle over the chopped garlic and ginger. Pour the wine into a large container and mix in the cumin, coriander, cinnamon and cayenne. Then pour it over the lamb shanks. Spread the mint jelly and the chutney evenly through the dish. Tightly cover the dish with tinfoil. Place in the oven and roast for 5 hours. 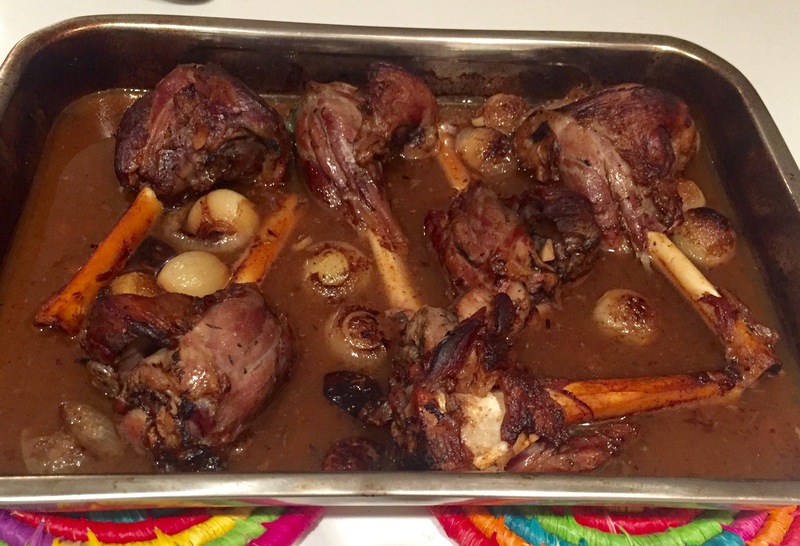 Check the dish regularly to make sure it is slowly cooking and to spoon some of the liquid over the lamb shanks. Gently turn the shanks over a couple of times during the cooking. Serve with cumin roasted potatoes and your choice of vegetables. My star anise carrot puree the perfect accompaniment, you can find the recipe by clicking here. 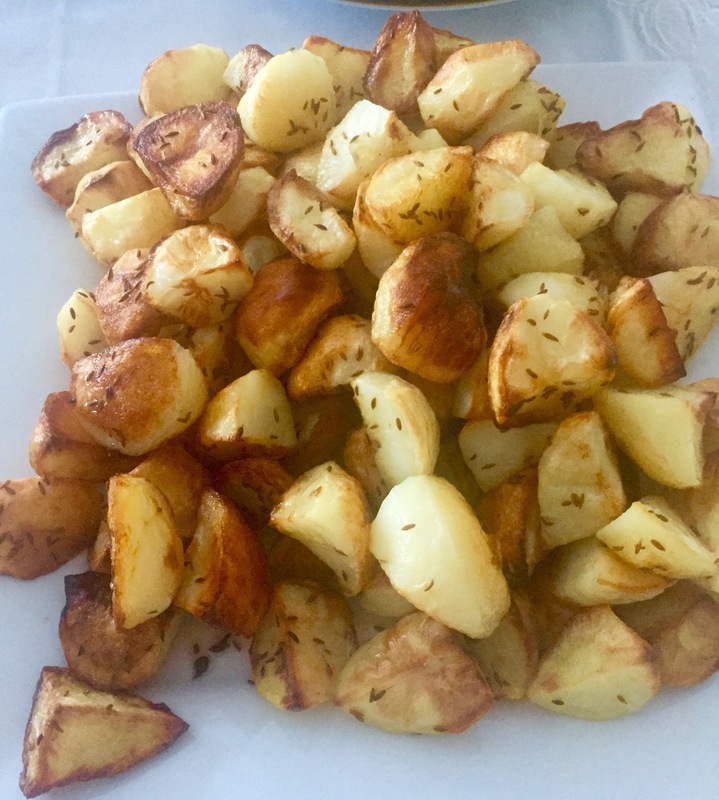 And you can find the recipe for the cumin potatoes (very easy and totally irresistible) by clicking here.